A draugr (original Old Norse plural draugar, as used here, not draugrs), draug or draugen (Norwegian meaning the draug) is a corporeal undead from Norse mythology. The original norse meaning of the word is ghost, and on older literature one will find clear distinctions between Sea-draug and land-draug. Draugar were believed to live in the graves of dead Vikings, being the body of the dead. Views differed on whether the personality and soul of the dead person lingered in the draugr. As the graves of important men often contained a good amount of wealth, the draugr jealously guarded his treasures, even after death. All draugar possess superhuman strength, the ability to increase their size at will and the unmistakable stench of decay. They were also noted for the ability to rise from the grave as wisps of smoke. The draugar slew their victims through various methods including crushing them with their enlarged forms, devouring their flesh, and drinking their blood. Animals feeding near the grave of a draugr were often driven mad by the creature's influence. Some draugar were gifted with immunity to usual weapons. To defeat a draugr, a hero was often necessary, since only such a man had strength and courage enough to stand up to so formidable an opponent. The hero would often have to wrestle the draugr back to his grave, thereby defeating him, since weapons would do no good. A good example of this kind of fight is found in Hrómundar saga Gripssonar. It is said that the draugr, even when defeated, would come back, requiring the hero to dispose of the body in unconventional ways. The most preferred method was to cut off the draugr's head, burn the body, and dump the ashes in the sea, the emphasis being on making absolutely sure the draugr was dead and gone. This may be related to the traditional practice of killing vampires seen in other cultures. The draugar were said to be either hel-blár ("death black") or, conversely, nár-fölr ("corpse-pale"). Some draugar were able to leave their dwelling place, the burial mound, and visit the living during the night. Such visits were universally horrible events, and often ended in death for one or more of the living, and warranted the exhumation of the draugr's tomb by a hero. A subtype of the draugr was the haugbui. The notable difference between the two was that the haugbui was unable to leave its grave site and only attacked those that trespassed upon their territory. The creature is said to either swim alongside boats or sail around them in a partially submerged vessel, always on their own. In some accounts, witnesses portray them as shapeshifters who take on the appearance of seaweed or moss-covered stones on the shoreline. A pair of open iron scissors were placed on the chest of the recently deceased while straws or twigs might be hidden among their clothes. The big toes were tied together or needles were driven through the soles of the feet in order to keep the dead from being able to walk. Tradition also held that the coffin be lifted and lowered in three different directions as it was carried from the house to confuse a possible draugr's sense of direction. The most effective means of preventing the return of the dead was the corpse door. A special door was built on, through which the corpse was carried feet-first with people surrounding it so the corpse couldn't see where it was going. The door was then bricked up to prevent a return visit. It is speculated that this belief began in Denmark and spread through out the Norse culture. The belief was founded on the idea that the dead only enter through the way they left. Arguably, the best known draugr in the modern world is Glamr, who was defeated by the hero of the Grettis Saga, as the saga includes a short account of him as a living man, and a full account of his haunting, up to the intervention of Grettir who wrestled him back to death. "It seemed as though the howe was agape, and that Gunnar had turned within the howe to look upwards at the moon. They thought that they saw four lights within the howe, but not a shadow to be seen. Then they saw that Gunnar was merry, with a joyful face". In the Eyrbyggja Saga a shepherd is assaulted by a blue-black draugr. The shepherd's neck is broken during the ensuing scuffle. The shepherd rises the next night as a draugr. 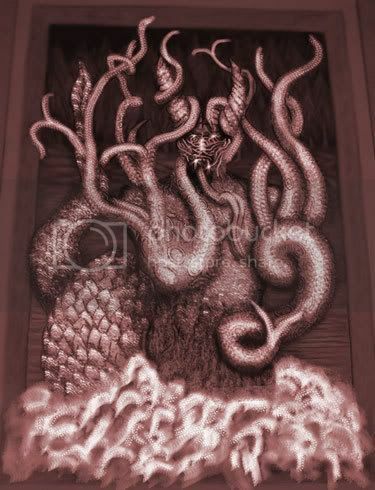 In more recent folklore, the draug is often identified with the spirits of mariners drowned at sea. In Scandinavian folklore, the creature is said to possess a distinctly human form, with the exception that its head is composed entirely of seaweed. In other tellings, the draug is described as being a headless fisherman, dressed in oilskins. This trait is common in the northernmost part of Norway, where life and culture was based on the fish, more than anywhere else. A recorded legend from Trøndelag tells how a corpse lying on a beach became the object of a quarrel between the two types of draug. A similar source even tells of a third type, the gleip, known to hitch themselves to sailors walking ashore and making them slip on the wet rocks. Norwegian folklore thus records a number of different draug-types. It was Christmas Eve, and Ola went down to his boathouse to get the keg of brandy he had bought for the holidays. When he got in, he noticed a draug sitting on the keg, staring out to sea. Ola, with great presence of mind and great bravery (it might not be amiss to state that he already had done some drinking), tiptoed up behind the draug and struck him sharply in the small of the back, so that he went flying out through the window, with sparks hissing around him as he hit the water. Ola knew he had no time to lose, so he set off at a great rate, running through the churchyard which lay between his home and the boathouse. As he ran, he cried, "Up, all you Christian souls, and help me!" Then he heard the sound of fighting between the ghosts and the draug, who were battling each other with coffin boards and bunches of seaweed. The next morning, when people came to church, the whole yard was strewn with coffin covers, boat boards, and seaweed. After the fight, which the ghosts won, the draug never came back to that district. The connection between the draug and the sea can be traced back to the author Jonas Lie and the story-teller Regine Nordmann, as well as the drawings of Theodor Kittelsen, who spent some years living in Svolvær. Up north, the tradition of sea-draugar is especially vivid. Arne Garborg, on the other hand, describes land-draugar coming fresh from the graveyards, and the term draug is even used of Vampires, in Norway translated as "Bloodsucker-draugar". In this sense, the draug is an undead. Draug sightings in modern times are not so common, but are still reported by reasonable and relatively sane individuals from time to time. Due to this trend, the term “draug” has come to be used in a more general sense in recent years to describe any type of revenant in Nordic folklore. The Norwegian municipality of Bø has the half boat of draugen in its coat-of-arms.